Conflict with nature; Conflict with self; Conflict with prevalent value systems. What is conflict? How to we thrive in spite of all conflicts? Is there a better way to manage conflict? Questions for which we seek answers forever. Unfortunately conflict is one imperative of truth which just won’t vanish as the entire universe is essentially a product of conflict itself. The dilemma being, there cannot be any creation without friction, forward movement ceases without friction. 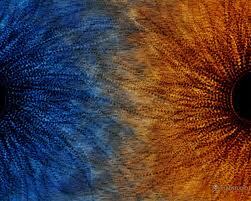 Conflicts originate through duality or Dvaita where duality means separation. Hence war persists on all fronts; a new Mahabharata every day. Surrounded by the Kuru warriors, each one an Abhimanyu, equipped with limited knowledge, does not know how to come out of this chakravyuh – the Chakravyuh of conflicts. The lack of that knowledge (Advaita) does not allow the Abhimanyu in us to break free from the formation of worldly desires and embedded conflicts. A desire to even break free from desires thus becomes a desire and hence conflicted. Man’s relentless pursuit of peace is elusive due to universal dualism (Dvaita) controlling the universe. The apparent form and shape of the universe, including the building blocks of atom, the electrons and protons have an opposing nature. The opposites always create some sort of conflict, but also very necessary for the functioning of the universe. When conflicts are not there, one notices a sense of intimacy or belongingness. A sense of Oneness is a characteristic often seen in the states of non-conflict. Hence one way of defining conflict is a state lacking in Oneness or Togetherness. How does one identify with this state of Oneness and practise that to resolve conflicts. Is that view of Advaita only useful for inner conflicts or for resolving outer conflicts in the world too? Conflict will always exist, how we choose to deal with it often determines our destiny. An examination of the actions by the various characters of Mahabharata reveals how our approach to conflicts often aggravates conflicts or does not fully resolve conflicts. And thereby it also defines our character and destiny. Most significantly, Krishna’s counselling to Arjuna on the battlefield reveals interesting insights into the role of Advaita and resolving the conflict, both inside and outside. 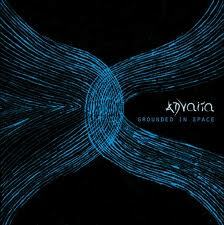 This knowledge of Advaita (non-duality- there is NO TWO!!) is the supreme knowledge rarely applied in moving ahead in conflicts. Each conflict situation produces its own unique response from the affected person or persons. The ability to recognize an appropriate strategy to deal with the conflict makes one effective in moving ahead in the world and yet remaining peaceful within. Dhritarashtra ­- blind at birth further blinded by love for his sons, does not think it prudent to counsel his sons against their rivalry with the Pandavas. Gandhari, his wife, also chooses to not see the reality of things by tying a cloth across her eyes. Blinded by a sense of misplaced loyalty, she also becomes responsible for the unnecessary saga of war. Both parents are unable to perceive the truth, largely due to their vain desire to see their progeny succeed. They keep “Accomodating” their son’s unjust desires and ignoring the issues of ‘Dharma’ – the duty which a king must fulfil for his subjects. Amidst us there exists the avoiding turtle, who at the mere sign of a disagreement withdraws into a self-imposed shell. Bhishma held such an exalted position in the Kuru kingdom, had he wished he could have prevented the entire massacre of Kurukshetra. Bhishma bound himself with the vow of self-abdication and proved that even an exalted virtue like selflessness can aggravate a situation. A leader’s reluctance to go by ‘Dharma’ – the act that must be performed and instead taking a stand that is just for the sake of pleasing the team often lets issues simmer. It is so easy to undermine the organization’s foundation by engaging in this strategy of accommodating or avoiding. Mere avoiding or accommodating does not take away the conflict. In fact it materializes with a much greater intensity as we see later in the Great War. The comfort zone for leaders – essentially is a failure to recognize that all attachments – to people, desires and concepts come from the very nature of Dwaita. Due to low intensity of the conflict at an early stage, the awareness and willingness of the individual to work from the space of Advaita is often limited. This is the paradox!! Even when the treasure trove of Advaita is readily available, we are reluctant to dive into it!! Duryodhana’s flaming ambition ( read Ego – the component of our existence fuelling duality ) compels him to weave webs of deceit, treachery and lies. His ambition is so sinister and grave that he builds a Lakshagrah (Palace of Wax) to burn his own brothers. This is Competitive conflict at its fiercest. A hyper-inflated Ego doesn’t even allow the being to even contemplate about Advaita. In its re-inforced belief that I am the winner or I deserve to be the winner of the world which is separated from me (the limited identity caused by ego). The inflexibility demonstrated by Duryodhana in his demeanour towards Pandavas is due to his strong Ego-sense. Most of the conflict situations in the world do arise due to a very strong Ego-sense. 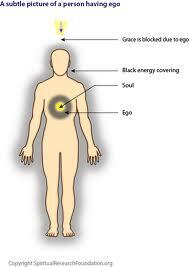 The dissolution of the Ego-sense leads to experiencing Advaita. Unfortunately the dissolution itself cannot be carried out by the mind-Ego complex. This is only possible due to divine grace, which Duryodhana does not even care about. 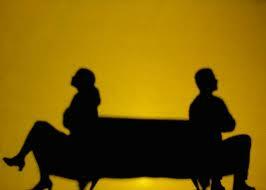 A compromise solution is often perceived as an easy way to resolve conflict. Here the apparent voice of reason is born out of a desire to end conflict but at the same time it is not rooted in Advaita. Here the assumption is – we are separate and we need to come close. The coming closer is just temporarily to alleviate pain or conflict. Yudhishtira, conscious of unending conflict bends down and dangles the compromise with five villages only to have lost his dignity in a game of dice. This is a beautiful example of an inner painful Conflict between temptation & Dharma. This compromise solution is just temporary. A real win-win Solution is only possible with a being who is an embodiment of Advaita himself. 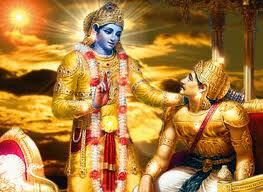 Krishna, the master collaborator always has the right solution for the moment. Note that, the right solution does not mean end to conflict but letting things unfurl the way they are supposed to be. With war clouds looming large, both Arjuna & Duryodhana seek Krishna’s support. The master collaborator lends Narayani sena to the Kaurava’s and Narayan (himself) to Arjuna. Now, that is letting a solution emerge as per the Dharma and also befitting the Karma of the individual. There is absolutely no Ego-sense interference in the working of the Advaita…the complete, perfect and all inclusive!! Satyam, Shivam and Sundaram. 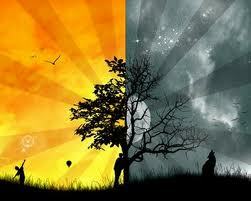 Human life is rooted in the duality of mind-ego complex which makes life a constant stream of conflicts. In this imperfect world, the duality is embedded and perpetual. On the plus side, we are all blessed with seed of Advaita, to end this constant Dwand of Dvaita…. Excellent blog you have here but I was wondering if you knew of any message boards that cover the same topics talked about here? I'd really love to be a part of group where I can get feedback from other knowledgeable individuals that share the same interest. If you have any recommendations, please let me know. Kudos!